Motorized window treatments will revolutionize your window design with modern efficiency, convenience, and style. At Read Design, we have custom motorized solutions for window treatments. We have a range of motorized solutions that include hard-wired and battery-operated choices for remote or wall switch operation for your window treatments, draperies, window blinds, and window shades. We work with the leading integrators to ensure a seamless operation. Motorization makes operating your window treatments easier than ever, and it also can help protect your interior against heat and sun while maintaining your view. From motorized drapery track systems to automated blinds and shades, we can help you implement a motorization system that’s perfect for you. PowerView Motorization enables intelligent operation of the most popular Hunter Douglas window treatments. Through its wireless technology, homeowners can adjust window treatments to control natural light throughout the home with the simple press of a button or tap on a mobile device, or through the automated operation. PowerView Motorization merges seamlessly with a connected lifestyle and provides a level of ease and convenience that is the crowning touch for Hunter Douglas window treatments. New wireless technology for increased radio frequency range, reliability, and two-way communication. Create personalized shade settings called Scenes within one room, multiple rooms, or throughout your whole home for just the right ambiance. Set your window treatments in motion at any time – from any place – with the RemoteConnect feature. Seamless home automation integration can be achieved through a single unit, the PowerView Hub. The Pebble Palette is available in seven on-trend colors to personalize and harmonize with any home decor. Black Matte, Citron, Clear Frost, Cobalt, Pewter Frost, Poppy, and White. The PowerView surface Remote fits any wall for visually pleasing, wall-mounted control. Available in three matte finish colors to complement any wall color. Black Matte, Nickel Matte, and White Matte. Add a PowerView Pebble Scene Controller or PowerView Surface Scene Controller to immediately access a personalized list of Scenes (this requires PowerView Hub for operation). The new PowerView App features a personalized user experience and a simple setup designed to fit your lifestyle. Available for Apple iOS and Android mobile devices. Transform light and set the mood in your home with the press of a button or tap of a mobile device. Schedule the operation of your window treatments to optimize your home’s energy efficiency. 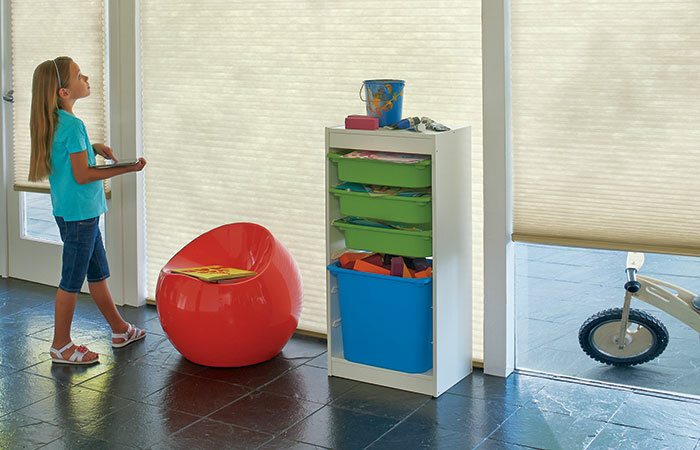 PowerView Motorization contributes to a safer environment for young children and pets. PowerView Motorization is the perfect solution for both newly constructed and existing homes. Battery and plug-in options are available. PowerView Pebble Remote reinvents remote control by creating an ergonomic fit, implementing more intuitive push-button control and adding “Favorite” position functionality. Modernize your window treatments with motorization, by scheduling a free consultation through Read Design! Use the Automation feature to set your Scenes to operate independently, whether you are at home or away. You can even schedule Scenes to operate with the sunrise or sunset based on your location.